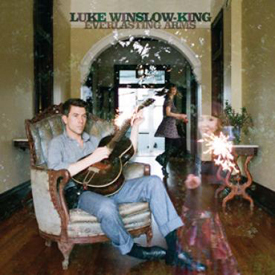 Although he’s been around for quite a while and has even visited my favourite watering hole several times, I’ve never had the urge to investigate Luke Winslow-King’s music, presuming him to be yet another one-trick pony old-timey act. How wrong was I? Winslow-King’s fourth full-length album opens with the joyous “Everlasting Love,” that has a jaunty Skiffle beat but sounds as fresh as a sprig of mint. The album goes through a further 13 songs that slip and slide gracefully through elements of jazz, country, folk and ragtime, never failing to get the toes a-tapping and my eyes a-twinkling. The trumpet intro to “Levee Man” is straight from the Satchmo book of cool, and then we get a banjo and tsh-tsh drumbeat accompanying Luke on a slick, soulful, jazzy love ditty that wouldn’t have been out of place on a Mississippi gambling boat at the turn of the last century. I love it. “Cadillac Slim” cranks up the tempo several beats on a raucous slice of country blues that features the glamourous Esther Rose on harmonies and backing vocals. Rose even gets to take the lead vocal on the delightful duet “Wanton Way of Loving,” which has some sublime fiddle and pedal-steel interplay as the combatants try to decide if they are going to stay together. Later, there’s a track called “Domino Sugar,” which is something of an alt-country ode to love. The guitar playing is so dirty, I hope the guitarist washed his hands in bleach at the end of the session. The album ends with a peach of a song called “Travelling by Myself,” which sounds like nothing I’ve heard in years, featuring some chunky Dobro and bottle neck guitar playing. Everlasting Arms has been like a breath of fresh air — ticking every single box I need for an album to be Album of the Year.